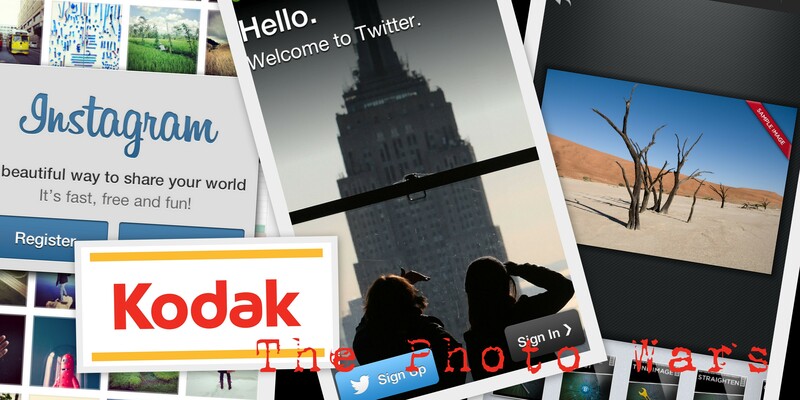 The race to become (or develop) the most popular photo-sharing app has taken an interesting turn over the past week, with Google and Apple forming an unlikely alliance to bid for patents from the former photo giant Kodak. Google, having recently made the popular photo-editing app Snapseed available for its Android platform last week, after being a paid-for app on Apple’s iOS platform since 2011. Google’s purchase of Nik Software (the company behind Snapseed) in September may have been an early indication of their intentions to integrate the software on their platforms such as Google+ and Picasa. Another point of interest was the sudden emergence of a battle between the Facebook-owned Instagram and Twitter photo-sharing platforms, with Twitter making the move of removing visibility of photos taken on Instagram off its timeline for users. Twitter’s earlier actions of removing integration with the app stem from July this year where they revoked access from Instagram users wanting to add their Twitter contacts on the platform. It could be suggested that the purchase of Instagram by Facebook for $1bn earlier in April may be a factor in the tactics used by Twitter, who want to retain control of their platform by either revoking or limiting access to their API from third party developers. Furthermore, the addition of filters for pictures posted directly through Twitter is an indication of the importance of pictures by competing directly with Instagram. In this current era of social media and technology, storytelling has become a key element for marketers wanting to reach out and connect with customers, building relationships and loyalty through the products and services they provide for them. The visual element of storytelling, promotion and advertising has become more viral with advances in mobile technology and the ease of sharing content over a variety of platforms. The current battlefield between Twitter/Instagram/Facebook and Google, Apple and Microsoft is a prime example of the fragmentation experienced by both marketers and customers to participate and connect with each other for the best social experience. Instagram and Twitter are social communities in their own right, with Instagram far more picture-oriented by its nature in comparison to Twitter, which also enables users to share their 140 character musings and article links from across the web. Both platforms are useful for marketers in monitoring and understanding user activity, especially in terms of how they communicate with other users and the type of photos they share that provide an insight into their personal lives. Instagram does have the considerable network strength of Facebook behind them (1 billion+ users and counting), who are taking steps to improve their mobile offerings to increase advertising revenues, making it an attractive platform for marketers working in the B2C business sphere. Twitter is a fast-growing network, with 500m+ users on the site and closely follows Facebook as a favoured marketing tool for companies, and seems to be more friendly as a B2B platform. Additionally, with mobile and tablets becoming a popular choice for users to access content, marketers need to take advantage of the opportunities that are present from using these photo-sharing platforms as a means of delivering unique content, telling stories and case studies that interest customers and businesses alike. The Photo Wars have just begun. 18/12/12 UPDATE: Instagram are seeking the rights to sell users’ photos to advertisers without notifying them. This is an interesting development in the changing landscape for photo-sharing, I wonder how Twitter may respond in the coming weeks and months with regards to it’s users data and content? This entry was posted in Internet, Marketing Communication, Social Media, Trends and tagged Apple, Apps, Aviary, Facebook, Google, Instagram, Kodak, marketing, Mobile, Photo, Snapseed, Social Media, Twitter on December 13, 2012 by Chux.